The Amateur Jockeys Association welcome the return of the popular Betfair Novice Flat Amateur Series for the fifth consecutive year. The Series is open to amateur jockeys who are members of the AJA and who at the start of the 2017 Flat Season have ridden no more than 3 winners under the Rules of Racing (both Jump and Flat). This excludes Point-to-Point and Arab racing wins. The Amateur Jockeys Association manage the series in consultation with the British Horseracing Authority. In addition Tim Reed, Jockey Coach, will be in attendance to walk the course with all participating jockeys before each race and to offer help and advice with a de-brief afterwards. Many thanks to Ilona Barnett and all at Stratford Racecourse for their kind generosity in allowing us once again to round off the amateur jumps season with our Championship presentations at their Hunterchase meeting on Friday night, with the fixture dedicated exclusively for the first time to hunter chasers and pointer-to-pointers. 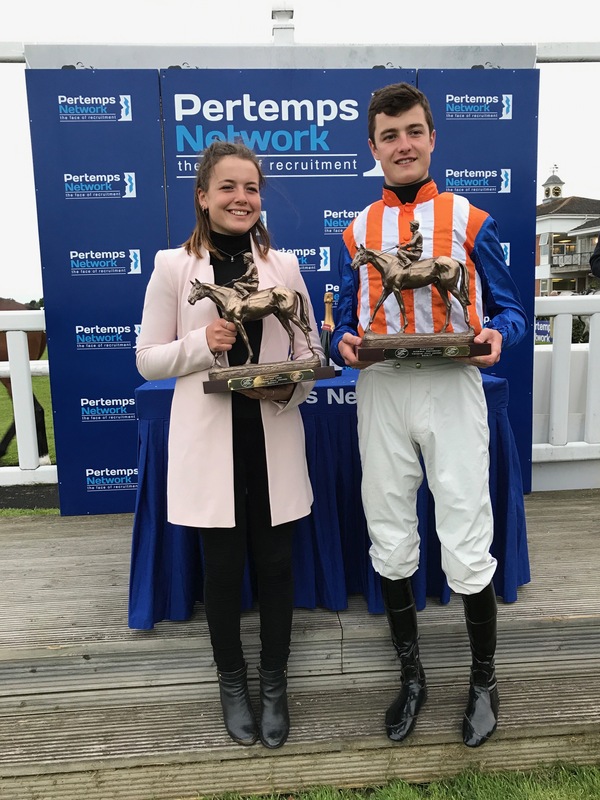 A huge round of applause to our 2016/17 Gentleman Amateur NH Champion Jockey JAMES KING and to our 2016/17 Lady Amateur NH Champion Jockey PAGE FULLER. Many congratulations also to our valiant runners up SAM DAVIES-THOMAS and EMMA TODD. It has been an extraordinary season culminating in a very tense final fortnight, James clinging onto his long time lead by an eventual single win right up until the conclusion of last night’s card. Winners eluded both James and Sam in their final appearances of the season but were enjoyed by MAX KENDRICK (Subaru Restricted Series Final), Ireland’s DAVID O’BRIEN (Foxdenton Gins Open Hunterchase), ALEX EDWARDS (John Corbet Cup), CLAIRE HARDWICK (Skinner’s Ladies Open Championship Final), JOHN DAWSON (Pertemps Foxhunters Champion Hunterchase), SHANE ROCHE (Sheldon Bosley Knight Handicap Hunterchase) and DARREN EDWARDS (P2P Bumper). 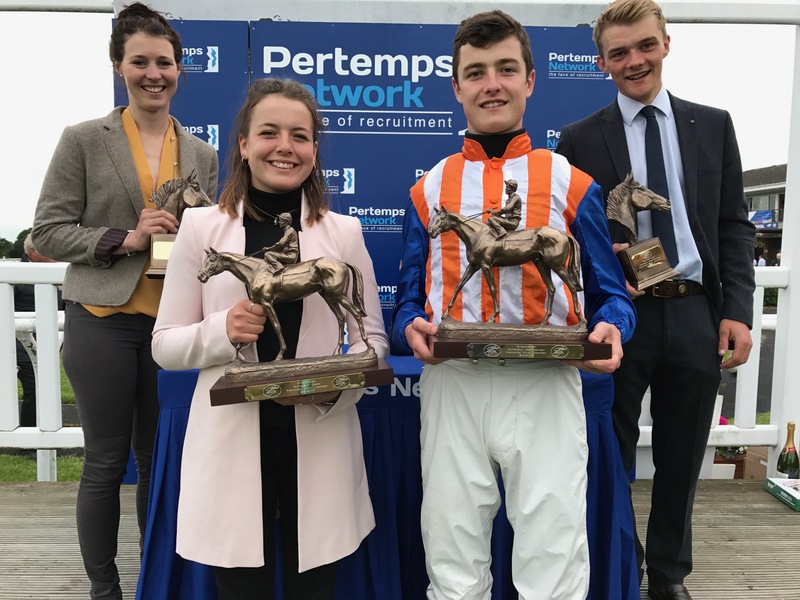 As is customary at this time of year, many of our most successful amateurs will be turning conditional and we wish them all the very best of luck in their future professional careers, proving once again the usefulness of the amateur route as a jockey training ground alongside point-to-pointing. A cautionary reminder to them all that anyone remaining conditional upon either reaching the age of 26 or a total of 26 winners as a professional can never revert back to amateur status as current BHA rules stand. We also wish luck to James whilst he considers his future career options, and to Page who has decided to remain amateur for the immediate future and focus on retaining her championship title. 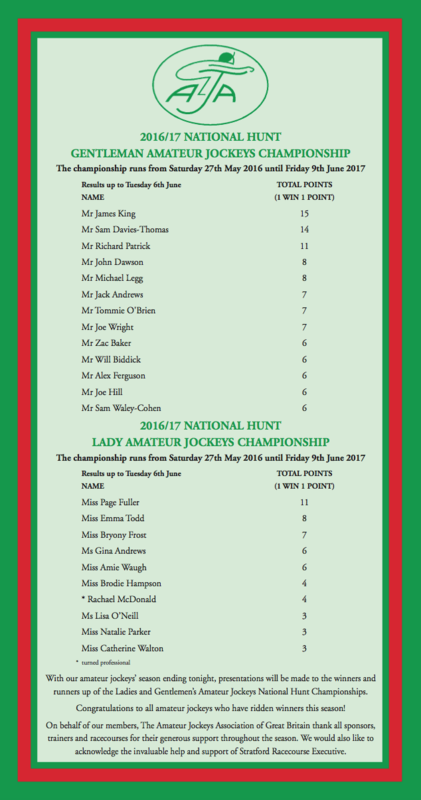 Many congratulations to all amateurs who enjoyed riding a winner in the 2016/17 season!